Welcome to the “Wonder Series,” a new series featuring some of your favorite musical creatives and what you may wonder about them with original photography and exclusive interviews. 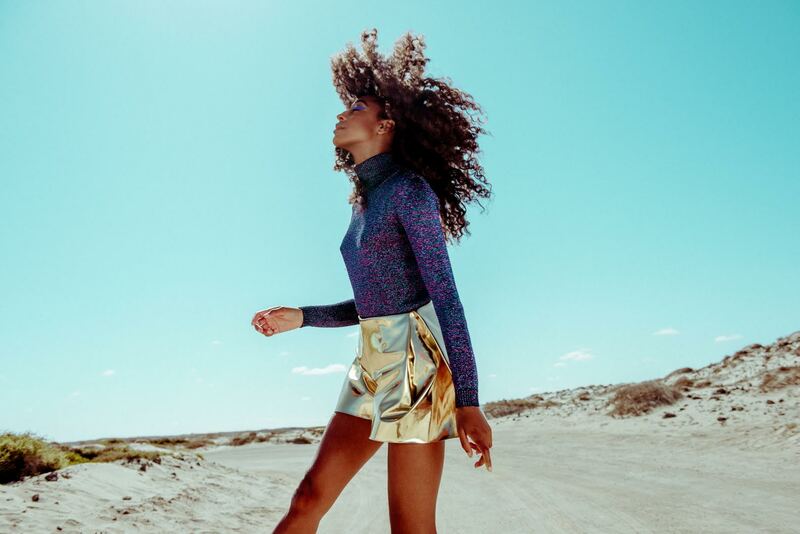 I kick off this series with the gifted and stunning Corinne Bailey Rae. Her talents are immense and exuded with such effortlessness one might be convinced that instead of wailing she was inundating ears with melodic tunes straight from the womb. 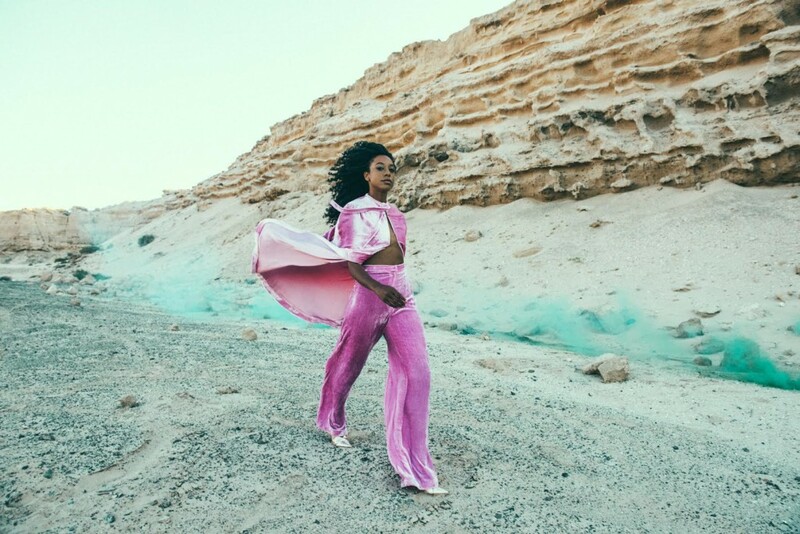 This six time nominated and two time Grammy winner has released three new mellifluous singles; “Been To The Moon,” “Green Aphrodisiac” and “Stop Where You Are,” from her upcoming album ‘The Heart Speaks In Whispers.” Step into the resplendent world of Corinne Bailey Rae through original photography captured by Alexandra Valenti, screen shots from “Been To The Moon” music video and an exclusive interview that delves into everything from music and performing to traveling, hair and what album she has on repeat. TQ: What is something you enjoy that others might find surprising? CBR: I love gardening, it’s so satisfying to see something you have planted growing and changing. I love being out in the blustery Yorkshire weather and dreaming up new plans for my garden or looking through books of old roses. My favorite garden designer is Piet Oudolf. TQ: Performing and touring is a pivotal facet for an artist. What do you enjoy most about performing? CBR: What I enjoy most about the performing is the connection and the sense of transcendence. It is such a powerful connection between yourself and an audience when you are on stage, you are all bound in that moment. I find in gigs I am able to just ‘trip out’ and lose a sense of where I am and what I am. TQ: In all your travels which destination left the biggest impression and why? CBR: Brazil is incredible because the culture, music and dance is so connected to the people; Japan I adore because of the way that nature informs the art, I find it fascinating. I love to travel and am always overwhelmed by discovery in a new place, like when you hear the birds singing and realise how much it has influenced the music in that place. Go to the Caribbean and hear the forest at night … you can hear the music of the Caribbean. TQ: You have performed at some amazing festivals and in front of large audiences. Have you ever had an embarrassing moment onstage? If so how did you get over it while onstage? CBR: I’ve been lucky that if anything embarrassing has happened to me on stage I haven’t noticed or remembered… so they can’t have been too bad. TQ: If you could spend the weekend with one person, past or present in music, film, literature or activism who would it be and why? CBR: I love Maya Angelou and I met her at a book signing about 12 years ago, where I was immediately reduced to tears. I find her work so powerful and insightful. I would to talk to her about life. I would love to hear her perspective on all the things that are happening now. TQ: You are a graduate from Leeds university with a degree in English. How has your studies and favorite authors played a role in your songwriting? CBR: Studying literature has brought such rich beauty to my life and given me so many perspectives on people, time, geography, history and politics that I never would have had. There are so many ways to tell a story and so many stories to tell. There is so much freedom in literature and poetry, there are no rules. You have so much power and choice and that is an important energy in songwriting. TQ: Amongst your travels what is the most common and oddest query you’ve received regarding your hair? 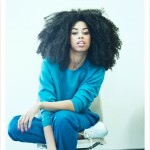 CBR: I find that people in general are much more informed about Afro hair these days. I’d say the stranger experiences have been in the past, when people were more ignorant. People ask me a lot if I’ve ever straightened it, some people want to touch it! Some people expect Afro hair to feel ‘wiry’ which is so sad to me. When people ask me, I say it feels like hair! TQ: What is your quickest hairstyle for a busy tour schedule? What is your favorite hair product? CBR: Quickest hairstyle is two braids, like milk maid plaits.. tied on the top… or a giant bun. My favorite hair products are Liz Earle Conditioner for Dry hair (which I leave in) and Rodin hair oil. TQ: What era of music do you find the most inspiration from? Who are a few of your favorite music idols besides your love of Nina Simone and Marvin Gaye? CBR: The late 60’s and 70’s in music is such a rich time for me, so experimental and soulful and politically engaged. But I also love 90′s band like Nirvana, who have ridiculously heartfelt songs, and Belly, Veruca Salt. It was Kurt Cobain and Billie Holiday that got me into singing – the rawness of it and the unconventional nature of their voices. I was in an indie band in the 90′s called Helen. I love aggressive music, wild guitar and massive riffs, I love Jimi Hendrix . If Crosstown Traffic comes on when I’m out, I lose my mind! I love gentle music, I love Curtis Mayfield, everything he’s done. I love Bjork and her singular voice and approach to music. Patti Smith’s poetry is unparalleled. I love KING and Thundercat and Moses Sumney, TV on the Radio and Kendrick Lamar. To Pimp a Butterfly will go down in history – it has so much to say and is so experimental. I love Paul Simon and Carole King, and Stevie Wonder is a God in my world. TQ: Have you been completely blown away by a live performance and if so who was the artist or musician? CBR: When I go to see bands I love I am always taken to another place. Most recently that has been Bob Dylan, KING, Thundercat, Patti Smith, St Vincent. TQ: Are you ever nervous before a performance? If so which performance was the most nerve wracking? CBR: I find it impossible to tell the difference between excitement and nerves. I always have that feeling before I go on. It always goes away when I get on stage. TV shows are hard because there is not a lot of time to get into it and they are over so quickly. TQ: You were on ‘Saturday Night Live,’ what was that experience like and was there a particularly funny or memorable moment? CBR: I loved playing Saturday Night Live because I got to use a string section for Like a Star and they sounded incredible. It was fun because Jamie Pressly was presenting and I knew her from My Name is Earl, she was hilarious! TQ: How old were you when you wrote your first song and what was it about? Can you tell us the lyrics of the chorus? CBR: I’ve written songs for as long as I can remember. I used to sing songs to the birds and sing songs about my dreams. I used to write songs for my church. My youngest ones I can’t remember but I remember the feeling…that it was magical, you could make things up and then they existed. I still find that miraculous. TQ: When you were fifteen-years-old you were in a indie rock group called ‘Helen.’ Which artist in rock do you admire and is that a genre you could see merging elements of or cultivating within your own music? CBR: I feel my music to have elements of indie because it is independently made. I have my own studio, I have taught myself to play guitar and sing and produce. My new album is my most experimental and is influenced by the freedom in rock music. I love tiny guitar figures and abstract quiet verses followed by loud noisy choruses. I love the way that rock music feels free and abandoned, it has its roots in blues, where I feel my music is rooted too. My favourite rock figures are Led Zeppelin, Jimi Hendrix, Patti Smith, Nirvana, Little Richard, Belly, Hole (I love ‘Pretty on the Inside’). TQ: What would you say to those who are teased or bullied for their differences? CBR: People tease you because they are scared of you. It’s great to be different and be uniquely yourself. Let your flag fly and don’t be afraid of ridicule. If you feel unsafe speak to a teacher or a parent. School is such a short period in your life. If it’s happening at work, tell your boss, it’s illegal. Read some biographies of the people you admire. TQ: Music is an important part of your life? What would you say to schools who are contemplating or have cut their art and music programs? CBR: Music teaches children communication skills, it helps kids to interact with one another and to find their place in a team, it improves their memory, helps them to express themselves , boosts their creativity and ability to solve problems. Music gives you discipline and teaches you about other cultures and historical eras. It’s not beneficial to the school or the pupils to take music and arts programs away. TQ: Have you met any of your music idols, someone you greatly admire in music and if so who and what was it like? CBR: I have met so many of my idols. Every single one of them has been so gracious. They are just people, with exceptional ability, but people all they same. Patti Smith is mysterious, Stevie Wonder is warm and open hearted, Dave Grohl is an encourager. TQ: What is the best piece of advice you’ve received from another artist in the music industry? CBR: Patti Smith, “Build a name, keep it clean”. Another artist told me not to rush my second album and I’m glad I didn’t. TQ: Is there an album or song from 2015 or this year you have (or had) on repeat? TQ: What song might people find surprising that you have thought about or would like to cover? CBR: I played Since I’ve Been Loving You (Led Zeppelin) on my first tour, which surprised a few people. TQ: Future or current projects you are working on? CBR: I have so many songs that I didn’t put on this new record. They are inspiring to me. I want to see where they will fit. TQ: What keeps you motivated? CBR: Wanting to do better, plus the ideas keep coming in so I have to pursue them, I have to finish them, I have to follow them and see where they go.